A Wisconsin woman has died of Rocky Mountain spotted fever in what Wisconsin health officials have confirmed is the first documented death from the infection in the state. "Rocky Mountain spotted fever is an uncommon but very serious tick-borne illness that can lead to death if untreated," says Dr. Bobbi Pritt, a parasitic diseases expert at Mayo Clinic. "It is very rare in Wisconsin. Only 69 cases have been reported from this state during the past five years. And most, if not all, of these infections were likely acquired outside of Wisconsin. However, we know that locally acquired cases have been reported from Wisconsin's neighboring state, Minnesota. So it's not a surprise that a patient exposed to ticks in Wisconsin got this potentially deadly infection," says Dr. Pritt. Rocky Mountain spotted fever is caused by infection with a bacterium called Rickettsia rickettsii. 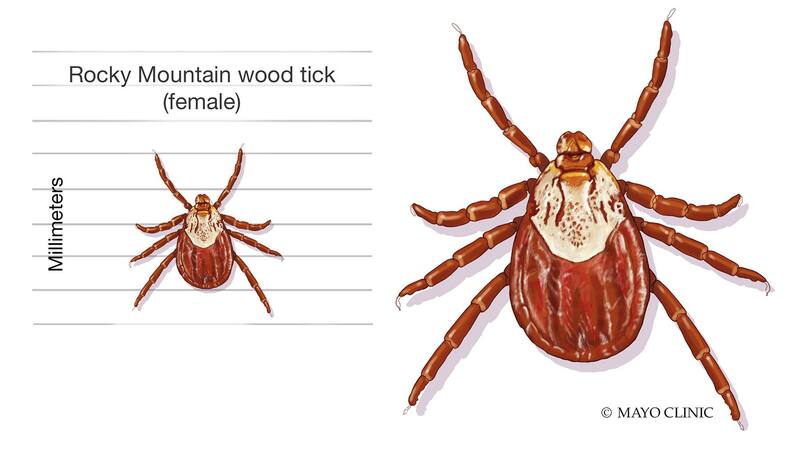 In the upper Midwest, it is transmitted through the bite of a Dermacentor variabilis tick, also known as a 'wood tick' or 'American dog tick'. However, other ticks in the U.S. also can transmit this pathogen. Dr. Pritt says it is most commonly reported from patients in the southeastern and south central U.S. Missouri, Arkansas, North Carolina, Tennessee, and Oklahoma have the most cases each year. Those infected with the tick-borne disease may begin to show symptoms 3 to 12 days after being infected. "Rocky Mountain spotted fever is another tick-borne disease that residents of Wisconsin and other states need to worry about. And therefore it's essential to take steps to avoid all tick bites. People often think that 'black-legged ticks' – also known as 'deer ticks' are the only ones to worry about, but the dog ticks are also important to avoid," says Dr. Pritt. Perform a thorough tick check after being outdoors. "With ticks, some of it is knowing where their habitat is — staying out of low-growing vegetation, bushes, shrubs — so something as simple as staying to the middle of a path," says Dr. Pritt. "If you're going on a hike, stay in the middle. Avoid the grasses — the tall grasses on either side." Dr. Pritt also recommends using insect repellent. "Wearing permethrin on your clothing and spraying a repellent on your skin, especially if you're going out into the deep woods and you really think you're going to be exposed, that's going to be your maximum prevention method."